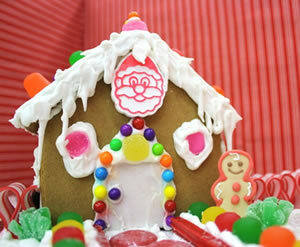 Create a felt gingerbread house with the kids during this holiday season. The how to is now available to download. The Holiday Cocoa Cone makes a great party favor for your holiday party, or stocking stuffer for your loved one on Christmas day! 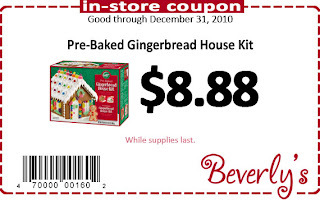 Make a fun Gingerbread House with this all inclusive Gingerbread House Kit. This kit is available now for $8.69! This is an online sale only. Get your gingerbread house while supplies last. New to Beverlys.com is the Robert Kaufman Dr. Seuss fabric collection - Celebrate Seuss. Fall in love all over again with these classic characters dancing around on these cotton prints. What a fun whimsical quilt this will make or use the fabric to decorate a special kids room. This fabric is just about guaranteed to bring smiles and joy to any room. Webkinz on sale $4.49 - $8.99. Online sale only. Webkinz are more than just a very cute stuffed toy. Each Webkinz also comes with a unique key that allows the Webkinz owner to register their Webkinz pet and participate with their pet in fun online activities many of them educational. This is a gift that can entertain a child all year long. All Brush Dance 2011 calendars on sale for $5.00. Online sale only. See the inside of the calendars and quality of them here! Then get your 2011 Brush Dance calendar at a super discount price of $5.00. These make great gifts. 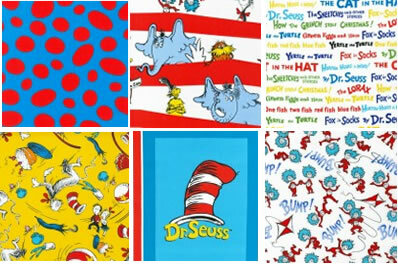 Special online sale on select Robert Kaufman fabric. 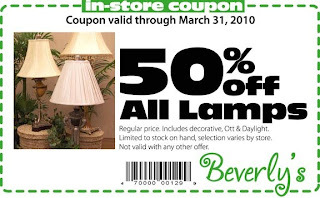 Come see the nice variety of solids, prints and more on special sale at Beverlys.com! Online Sale Only. Special Online Clearance Sale for Calendars and Gift Baskets! There is a special online clearance sale for Brush Dance 2011 Calendars and wonderful discount Gift Baskets! Get your holiday shopping done early and save! 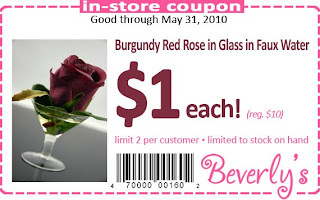 Visit beverlys.com to see the entire selection of calendars and gift baskets at discount prices! Online sale only. 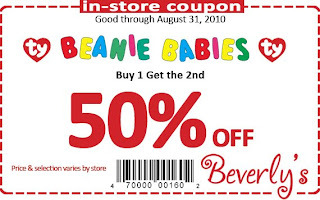 Click the coupon to print it out and stop by your local Beverly's store during the month of August to get 50% off a Beanie Baby with the purchase of another at full price. These toys are so cute and fun and will give your child years of enjoyment. We hope to see you soon! Tie-dying is the perfect summer craft project that allows you to soak up the sun and enjoy some quality time with your kids while they are home from school. Encouraging hands-on arts and crafts projects for your kids can improve their creativity abilities while having a great experience. Most people may be turned off by the potential mess and staining of tie-dye, but if you follow these directions the only problem will be making sure your entire wardrobe isn’t tie dyed. First thing is gathering the supplies. Keep in mind that organization will help lower the chances of having a big mess to clean up at the end of the project. Beverly’s can be your one-stop shop for all the supplies, which will make your summer tie-dying experience with your kids more enjoyable and stress free. • Any White Fabric - Shirts, pants, swimsuits, sheets, towels etc. • Rags and/or Paper Towels – Just in case! 1. Start with pre-washing all fabric items in the Soda Ash and hot water, then rinse and set aside. 2. Prepare dye according to the directions on the box. Keep in mind the water-to-dye ratio, more water the lighter the color and vice versa. Be sure your wearing your rubber gloves! 3. Take each piece of fabric, lay flat and tie as desired. Let your creative energy flow and it will turn out great. Check out some tie-dye methods & patterns on Wikipedia. 4. Now start applying the dye. The options are endless, use multiple colors, dye by section or just apply the dye and hope for the best. One simple rule of thumb if using more than one color: Start with light colors. 5. According to brand of dye, rinse immediately after or wait a given amount of time. Most dyes require the tie-dyed items to set for 24 hours in a plastic bag, which helps increase the intensity and wear-time of the colors. 6. Wash all containers, surfaces etc. that were exposed to dye with soap and water. 7. Once the tie-dyed fabrics have set, wash in cold water and separate from other clothing. Tie-dye summer craft projects can engage the entire family this season. 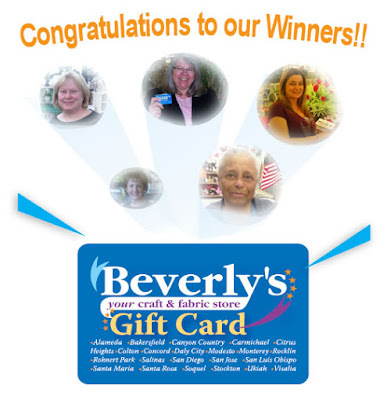 Come pick up the needed supplies at your local Beverly’s Fabric & Crafts or shop at beverlys.com. I recommend the Tulip® One Step Fashion Dye™ for purchasing individual colors. Also available are convenient tie-dye kits, so depending on your preference Beverly’s can supply it. Have a great summer with your kids and Happy Tie-Dying! 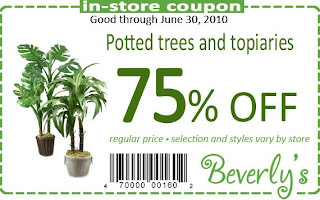 Print this coupon and visit us during the month of June to receive 75% off the regular price of potted trees and topiaries. Expires June 30th. The selection and styles of our potted trees and topiaries will vary by store. We look forward to seeing you! Buy 1 MakingMemories Item, Get 1 Free! 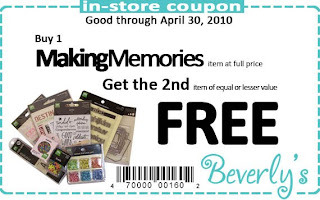 Print our new April coupon and bring with you on your next visit to your local Beverly's store to receive a free MakingMemories item of equal or lesser value with the purchase one at full price. Expires April 30th. 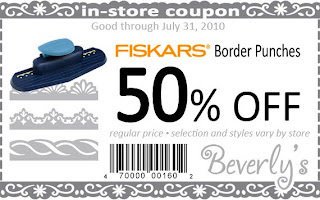 We hope to see you stopping by soon with this great coupon! A great party favor for your next spring festivity or Easter gathering. Kids will love helping put these together with you while eating a few candies along the way, of course ;) ...Make a bunch and tie name tags to each, place in a big basket and let your guests leave your home with a fun treat! Click the picture to download the step-by-step tutorial. PS. Your local Beverly's store has one of these on display right now, so be sure to stop by to see the real thing and pick up your supplies. Aren't these the cutest little dolls? Your kids will need only a few supplies to make a ton of these just for fun or to give to their friends. Click the picture to download the step-by-step tutorial. 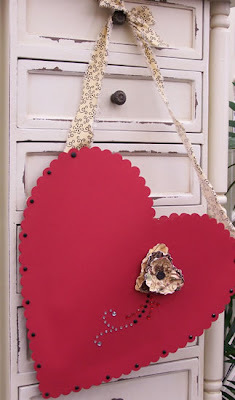 Click the picture above to download the directions and cutouts for this cute little project. The Treat Tube Rabbit can be used as a party favor at each person's place setting, could be part of the center piece...Or simply put all the pieces into individual kits and have the kids make them together at a party! The possibilities are endless, easy and fun.